Castle’s NEW Human Vibration Meter! The Ultimus is the new fully featured hand-arm and whole-body vibration meter from Castle Group. 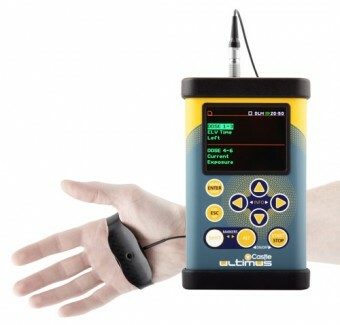 The company says that with a completely new way to measure vibration, this development will give customers ultimate control over their human vibration monitoring programmes and will potentially halve the time it takes to get the readings required for the Control of Vibration at Work Regulations 2005. The Ultimus is capable of measuring 6 channels at once, so can either measure on two handles of a hand-held power tool or can measure whole-body vibration from a vehicle at the same time as measuring, for example, the hand-arm vibration from the steering wheel! This feature is combined with large memory, colour display and the very latest in MEMS (Micro Machined) sensor technology. The accelerometer system used on the Ultimus allows measurements to be taken in a completely new way, without the need to fix the sensor onto the tool! The Ultimus, as well as having a brand new way of measuring vibration and the ability to measure 6 parallel channels, can also measure octave and 1/3 octave bands if required. It will also simultaneously measure all the parameters needed for compliance with the control of Vibration at work Regulations 2005.